Chadian rebels have captured the town of Guereda on the country's eastern border with Sudan. A column of rebels in pick-up trucks mounted with heavy weapons stormed the town in heavy fighting on Friday. The government had recently reinforced its soldiers in the town with more weapons and ammunition which may now be in rebel hands, correspondents say. Rebels launched a campaign earlier this year aimed at overthrowing Chad's President Idriss Deby. The Chadian army had spent several days reinforcing its detachment at Guereda, flying in more soldiers, weapons and ammunition. 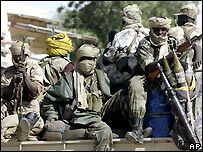 The army planned to trap the rebels nearby in a pincer movement, with more government troops coming from Abeche. But the rebels acted first and captured Guereda, and the government fears its weapons stocks are now in rebel hands, the BBC correspondent in Chad's capital N'Djamena says. More than 80 people were being treated for bullet wounds in Guereda's hospital, aid workers said. Last week, rebels attacked and briefly held the eastern town of Abeche before disappearing back into their strongholds in the mountains and desert. Chad's government is being assisted by a military contingent from former colonial ruler France that includes jet fighters, Reuters news agency reports. Amnesty International (AI) says it has evidence that attacks by Janjaweed militia from Sudan are taking place 150km (93 miles) inside Chad. Guereda is about 30km (19 miles) from the border with Sudan's Darfur region. On Friday, the United Nations refugee agency airlifted more than 100 tonnes of relief supplies to Chad to replace stocks which local people looted from a warehouse last weekend when rebels took Abeche. The goods were taken by local people, but some have been returned following house-to-house searches by the military. The UN says about 90,000 Chadians have been displaced by the recent fighting. Would you give up your child?